The obvious theme in my 2017 reading picks so far has been negligent guardians, and I feel like the universe is berating me for not appreciating the extravagant love and nurturing that my own parents have given me. Allegedly was a powerfully heart-wrenching depiction of the foster care/group home system. It was also simultaneously a story about a once-small girl accused of murdering a 3-month-old baby. But for me, the conviction aspect played such a small supporting role in regards to the narrative-I couldn't bring myself to care about if it was true or not, nor the tangled web it weaved. Mary B. Addison is a child killer. At least that's what we're told she's in for. "In" being a group home with at least 4-5 other girls, which follows a stint in "baby jail" (as Mary lovingly referred to it as). And I say "4-5 girls" because I was never really sure. The author had a lot to offer when it came to heart-tugging scenes, but side character development suffered in this novel. I was never able to differentiate the multiple voices-their tones, grammar, and expletives all blending into one. It wasn't until a couple of them were singled out for a specific disagreement or interaction with Mary that I took an interest. Scattered throughout the novel were excerpts of past and present interviews with child psychologists, police inspectors, cell mates, and the deceased baby's mother. It was meant to build an element of doubt, or belief, or both if you will. All it resulted in for me was a frustrating, and sometimes repetitive, interruption to a story that I was otherwise enjoying. The conclusion of Allegedly was without fanfare and for me, was another unnecessary addition. It veered slightly to the right of the ongoing plot, but just SLIGHTLY. I felt like the author was going for a more gut-punch "twist", but it was more like pulling aside the curtain and finding a little old man instead of an awe-inspiring green-headed giant (just a little Wizard of Oz reference for ya). I think I morphed the intended genre for this book into another one entirely, and that suited me just fine. I look forward to seeing what this author tries their hand at next. For readers who enjoy: Far, Far Away by Tom McNeal, The Impossible Knife of Memory by Laurie Halse Anderson, mental health issues in fiction, contemporary, mystery. 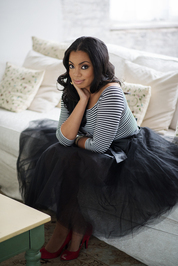 Tiffany D. Jackson is a TV professional by day, novelist by night, awkward black girl 24/7. She received her Bachelor of Arts in Film from Howard University and her Master of Arts in Media Studies from The New School University. A Brooklyn native, she is a lover of naps, cookie dough, and beaches, currently residing in the borough she loves with her adorable chihuahua Oscar, most likely multitasking. 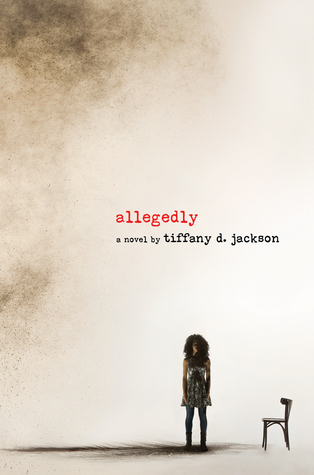 Her debut novel, ALLEGEDLY is due January 24th, 2017 through Katherine Tegen Books, an imprint of Harper Collins.